I am happy to show this cheerful quilt made by Anita. She found a wonderful way to cut apart the Blossom Lane Panel and turn into an adorable nice-sized quilt using other complimentary fabrics. I just love seeing everyone’s beautiful creations. If you are looking for any of these fabrics, check your local quilt shop first & if it isn’t available, here are a few choices online….www.penningtonquilts.com, www.pinegrovequiltshop.net and www.fabricdepot.com. Here is Anita’s lovely message below. I found your lovely panel in one of our local quilt shops in Kuala Lumpur and simply fell in love with it. I immediately bought 2 pcs! However, it didn’t come with any accompanying fabrics so it sat for quite some time while I figured out what to do with it. As it was a bit narrow, I decided to cut and patch ’em up. Here’s how it turned out – thot I wld share with you. TQ for such lovely fabrics! I would like to thank Mrs. Haslina Haroon for sending me a picture of the Blossom Lane quilt she made. What a beautiful, wonderful creation! Here is her kind message below. I found your pattern on the Fat Quarter Shop website, and wasted no time looking for co-ordinating fabric. I am proud of what I have produced (included in the attachment) and would like to thank you for coming up with such beautiful fabric. For more collections, check your local quilt shop first & if it isn’t available, here are a few choices online…www.kikiquilts.com, www.fabriccenter.net, www.quiltpatchva.com and www.originalquilts.com for Blossom Lane fabric/patterns and also a new collection called Tweet by Wendy Bentley through Timeless Treasures Fabric. Are you looking to do an adorable quilt? Check out this quilt featuring Alice Kennedy’s Strawberry Field and Wendy Bentley’s Blossom Lane through Timeless Treasures Fabric. 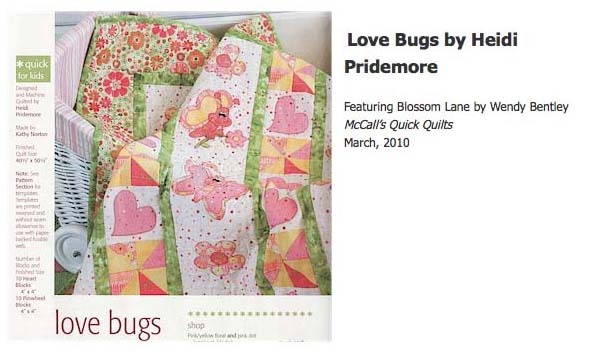 The Love Bugs Quilt was featured on the Cover of McCall’s Quick Quilts March, 2010. The design was machine quilted by Heidi Pridemore. 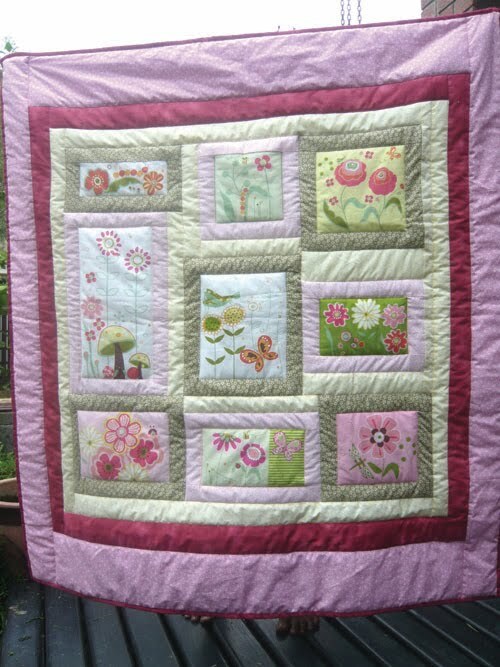 If anyone else makes this quilt, send me your information and picture and I will feature it on my blog. 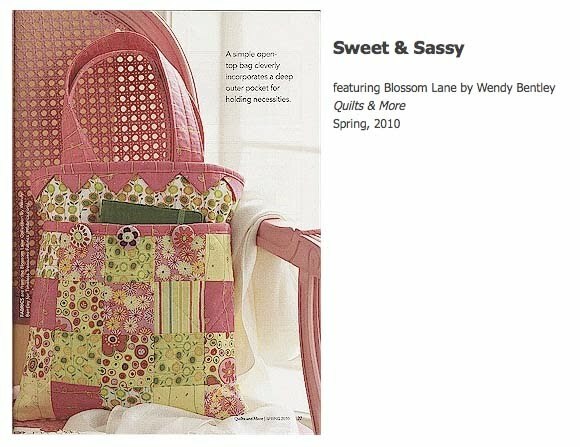 Look at this cute bag featured on Page 26 in the Quilts & More Spring, 2010. The designer, Sherri K. Falls used my Blossom Lane fabric by Timeless Treasures. All the easy-to-follow directions are included in this article. Or to find the pattern, you can go to thisandthatpatterns.com. 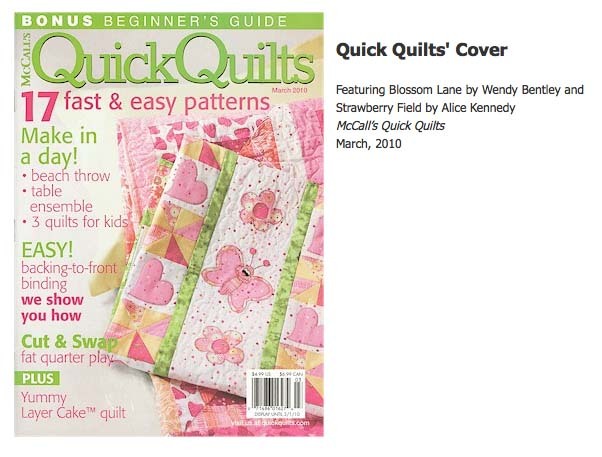 You can also still purchase this magazine, as well, just type in Quilts & More Spring, 2010 in your browser. If anyone creates any fabric products with Blossom Lane Fabric. Please send me information and a picture, so I can blog-brag about you! Look for this collection at your favorite local quilt shop or or try these on-line stores—www.needleandi.com, www.rainbowsendquiltshoppe.com, or www.greatamericanquilt.com.